As the year is just about to wrap up, you can catch my tradition of making 7 crazy predictions for the following year in real estate. That episode of Prime Properties TV is now available for online viewing. 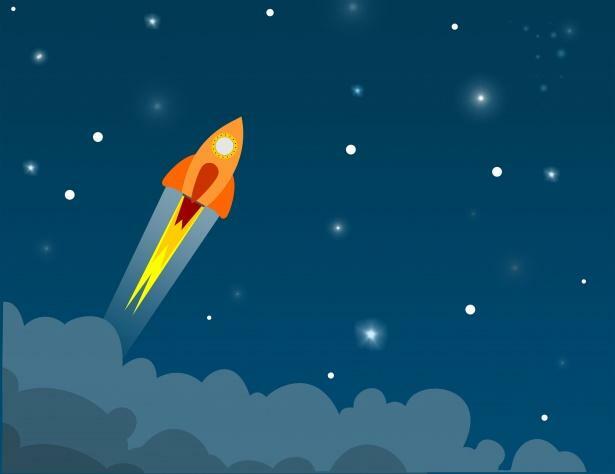 Watch Zhen’s 7 Crazy Predictions for 2019 HERE! Spoiler Alert! As a sneak peek to this week’s episode (if you haven’t already watched it), one of those seven crazy predictions is rental rates skyrocketing as high as 11% in Toronto. The Source – The 11% actually came from a very well-trusted real estate analyst, Big Ben Meyers. His firm, Bullpen Consulting, in conjunction with Rentals.ca, are forecasting for an 11% increase in rental rates in Toronto. Report in a Nutshell – Ben is a great person to follow on Twitter if you want good insights on the market (that is, if you are in the Twitterverse). In Ben’s latest report, he essentially outlines what we have been discussing all year long that will drive rental rates up. Here are the summarized cliff notes. When you mix all of those conditions into a cocktail called the rental market, it drives up the price unless there is a pressure relief valve on one of those conditions. As I write this Insight Article, it doesn’t look like there is any relief coming in that regard. If you want a more in-depth read of Ben’s National Rent Report, you can check it out here: Read Ben’s National Rent Report. Average Asking Rent – At the moment, the rental market is already incredibly tough for families who are looking to find an appropriate-sized unit that is also affordable for them. Take a look at the chart below. Five cities in the GTA are WAY up there in terms of average asking rent, that is, over $2,000 per month. 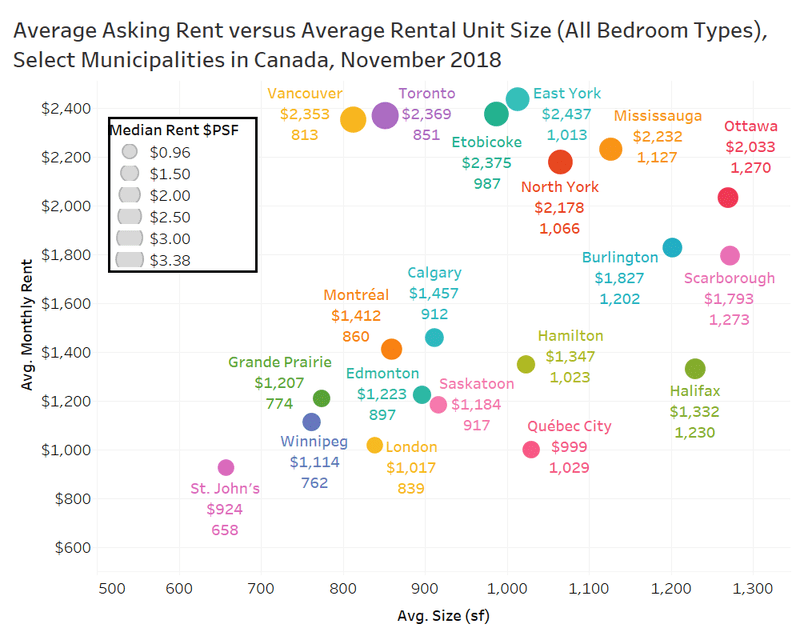 Toronto has surpassed Vancouver in rental rates already, and if you combine that with the new high rises that will be completed soon (that are even smaller), it means that we should be expecting even higher density levels. You Get What You Pay For – Typically, what people can afford doesn’t change too much. You can shift a few monthly expenditures around and put more in living expenses as you need to. However, generally speaking, what you pay in rent will be the roughly the same, only except, what you get will likely be smaller. Above Average – Some condo investors may look at those rental numbers and have rental properties that have much higher in rent attached to them. You must remember though that these stats include many of the older apartments in Toronto as well that are under rent control. You can expect the rental numbers for downtown condos to be much higher than the averages in the chart above. Opportunity is Knocking! 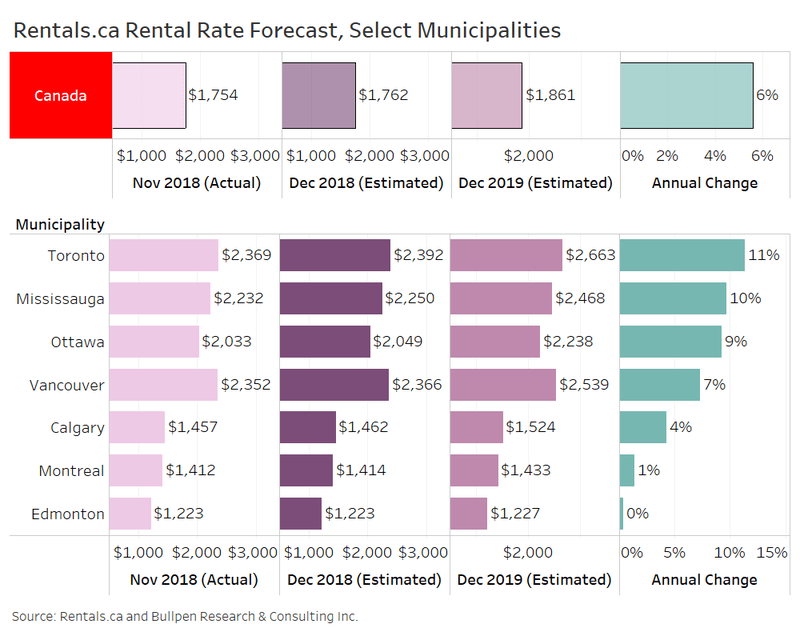 If you look at the average rental rates projected for December 2019, we’re going to be at $2,663 in Toronto. Just imagine what the condo rental rates in the downtown core will look like then! The first thing that jumped out to me when I read this was “If I can get close to $3,000 per month in rental income, then buying a condo right now will make my investment cash flow positive by the end of 2019.” That’s an opportunity right there! Bingo! The key thing when evaluating rental rates, in my opinion, is looking at the economic fundamentals surrounding the Golden Horseshoe. Even with the predictions of 2 to 3 interest rate hikes over the course of 2019, we still have very strong job growth, major tech companies coming to Toronto, the liberal government pushing for even higher immigration plus the major lack of supply coming online in 2019. All of this will likely result in that 11% (if not higher) rental rate increase by the end of 2019. The Wrap – If you are expecting vacancies in 2019, then GET READY! It’s going to be insane! That is, insanely great for you if you’re a condo investor! If you’re looking to find the best suitable condo for your investment needs and strategy that will cash flow positive, be sure to contact me before the year ends! Next Next post: How to Buy a Property for LESS Money During the Winter!